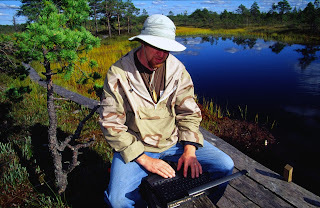 In Estonia you can access Wi-Fi internet even in the forest. Estonia is the worlds leader for utilizing an e-government. Citizens are issued an ID, which can be used via a mobile phone to view health records and prescriptions, pay for public transport, view their child's school grades and even vote in elections. "e-Estonia", the E is for electronic, has become the go to tag to describe Estonia's immensely successful love affair with all things networked and digitized. Country wide enthusiasm for the efficiency of E has enthralled both citizens and policymakers alike. Estonian programmers have been behind the creation of digital brands such as Skype, Hotmail and more recently Transferwise (a online currency converter which has attracted investment from the likes of Richard Branson). Estonia has declared internet access a human right, it has a thriving IT start up culture and has digitally streamlined an unprecedented number of public services for citizens and businesses.